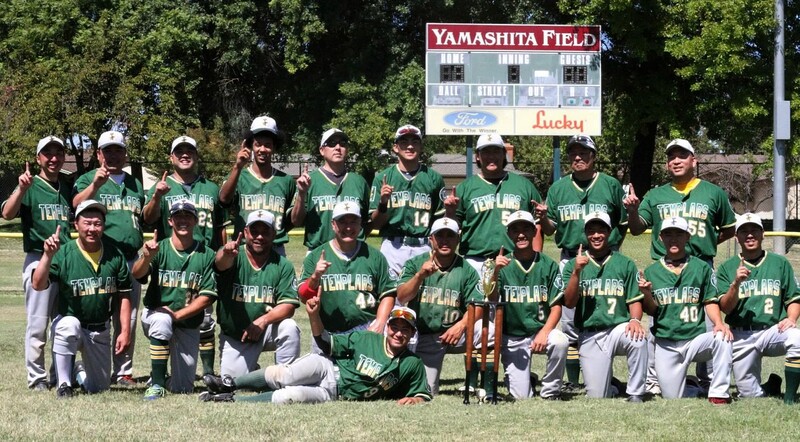 The Lodi JACL Templars celebrate their victory at the plate. Four teams from Southern California — the Gardena Rebels, the Gardena Knights, the Lil Tokio Giants and the Los Angeles Pirates — drove up I-5 to meet the four representatives from Northern California — the San Francisco Hawks, the Florin Athletic Club, the Lodi JACL Templars, and the Fresno Sansei — to determine who would walk away with the 2015 Championship trophy. 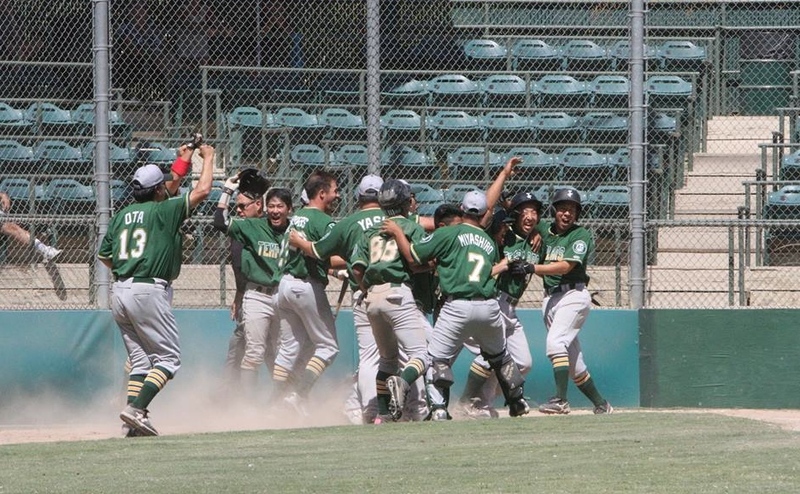 Funnily enough, this tournament and the Lodi team itself almost did not happen due to lack of players on the Lodi roster – too many other activities were taking Nikkei kids away from baseball. Or so it seemed. Conceived in 1915, the team was celebrating it’s 100th anniversary – the former coach and benefactor, Lodi baseball legend Mauch Yamashita, who passed away in 2011, had left the team a very healthy endowment, so finances were not the issue. But, through an aggressive PR campaign and grassroots recruiting, the Templars managed to assemble enough of their veteran players with a healthy addition of new young players to grind out a 9-9 record through the regular season, including winning four of the last five games. The Lodi JACL Templars pose at Mauch Yamashita Field with their trophy. Lodi earned the #3 seed in the North, so they met the #2 seed from the South, Lil Tokio Giants, for the opening round of the tournament. Behind a superb complete game pitching performance by the Templars’ Alex Rivers, who struck out 13 Giants batters, Lodi defeated Lil’ Tokio, 3-1. Rookie Keoni Mark provided the big bat in the game with a two- RBI double and Lodi advanced to the semi-finals against the #4 seed Los Angeles Pirates, who had upset the #1 seed from the North, San Francisco Hawks. In the Semi-final, Lodi had Reid Yamamoto on the mound. He did a great job of keeping the powerful Pirates lineup off balance and was able to keep the Templars in the game until the Lodi bats came alive in the sixth inning with seven runs. 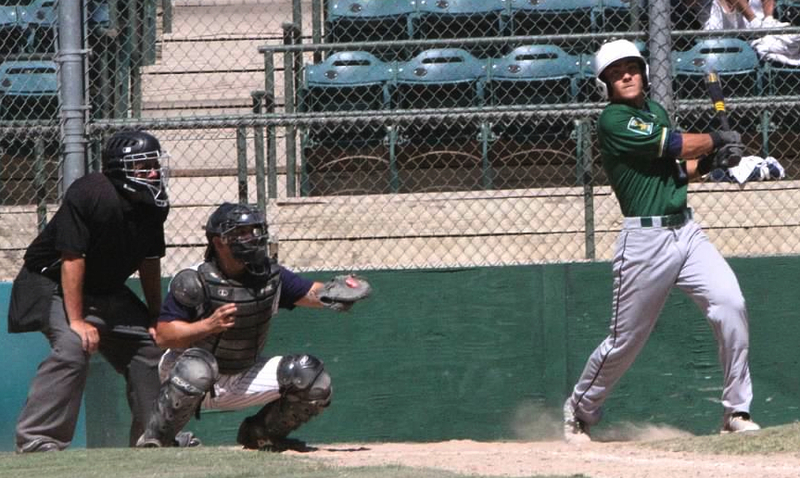 The Templars cruised to a 14-4 victory and were headed to the Tournament Championship game. Manager/player Mike Furutani holds up the trophy. In the past, Lodi had been a powerhouse in the single “A” division, winning three consecutive titles in the ’60s and most recently in 1992 – but they had never even won an AA tournament game in their 100-year history. To win two and now be in the Championship game was completely uncharted territory – and to make things more interesting, Lodi would be facing their good friend and nemesis, the Florin Athletic Club, who defeated the #1 seed from the South and defending champions, the Gardena Rebels. Lodi and Florin played each other six times during the regular season, Florin taking the series 4-2, so the Templars had their work cut out for them. First year player/manager Mike Furutani and general manager Dwight Ota decided to go with Yamamoto to start the Championship game played at Tony Zupo Field in Lodi, a former minor league park. Yamamoto had had great success against Florin during the season, but since he would have less than 24 hours’ rest, the leash would be short. He proved to be up to the task as he battled through five innings and left the game with a 6-4 Lodi lead. Rivers then took the ball and blew through the Florin line-up for the next three innings, striking out five. It looked like the Templars were on their way to their very first AA title – until the top of the ninth. 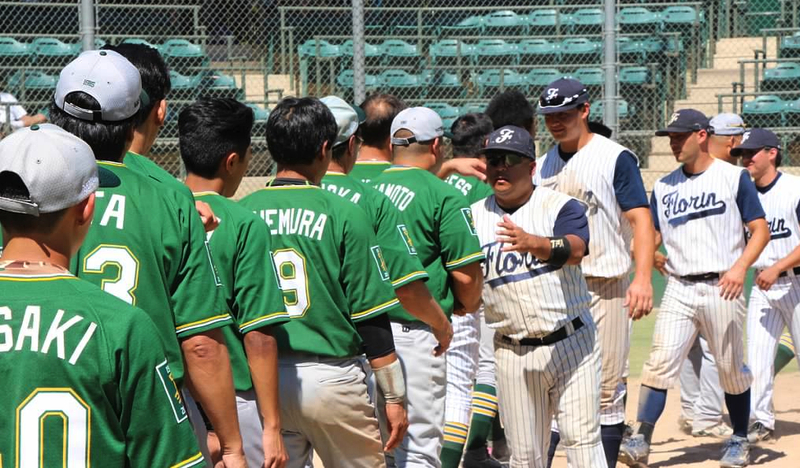 Florin had been coming from behind all tournament and this game would be no different – after a couple of defensive miscues by Lodi, Florin not only tied the game with two outs but went ahead by six runs until Furutani came in to get the last out of the inning. Lodi got a jolt of lightning from Justin Uemura with a leadoff triple – then they started chipping away with a couple hits, a couple walks (including a walk by Brendan Noguchi, the youngest Lodi player at age 15, pinch-hitting), a hit-by-pitch, a sacrifice fly, and all of sudden, the Templars were only down by two runs! The veterans had come through, the younger players matured and the rookies played no fear! So many things went the Templars’ way including Corey Furuoka, a pinch runner, stealing second during the rally, with his slide knocking the ball out of the shortstop’s glove. With two outs, the tag would have finished the game with a Florin victory. 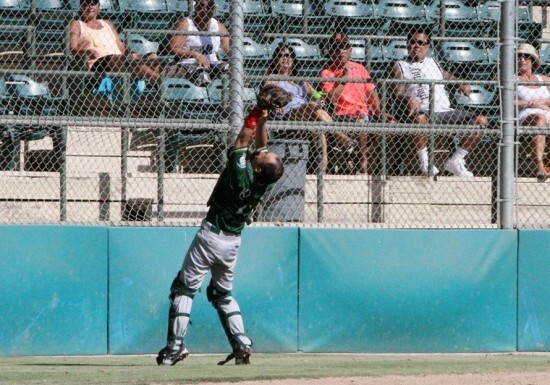 And in what could possibly be one of the biggest hits in Lodi JA baseball history, young Davis, son of former Lodi player Dr. David Yasuda, lined a slicing shot down the right-field line that landed half a foot fair and went into the corner. Jason Callejo scored from third, Cory Furuoka scored from second and Sensei Katsu Kusunoki, the reverend of the Lodi Buddhist Church, huffed and puffed all the way around from first to come in and score the walk-off game-winning run to complete the inconceivable and magical seven-run rally comeback that gave the Lodi JACL Templars the 13-12 win and the 2015 California State AA Nisei Baseball Tournament Championship – the first-ever AA Championship crown in Lodi JA baseball history. “I just thought, I have to keep running. I’m 38 years old, I’m not so fast anymore,” Kusunoki said. “I knew I’m the winning run, so if I become out, game is over, so I was just thinking to run as fast as I can. Katsu Kusunoki makes the catch. And when he crossed the plate, the celebration was on. Teammates first mobbed Kusunoki at the plate and then turned their attention to Yasuda at second base. No jerseys were torn off, but there was a bottled water dousing. The Templars lined up to congratulate the Florin team and then the parents, family and fans that had stuck around for the whole amazing episode. Davis Yasuda gets the winning hit. 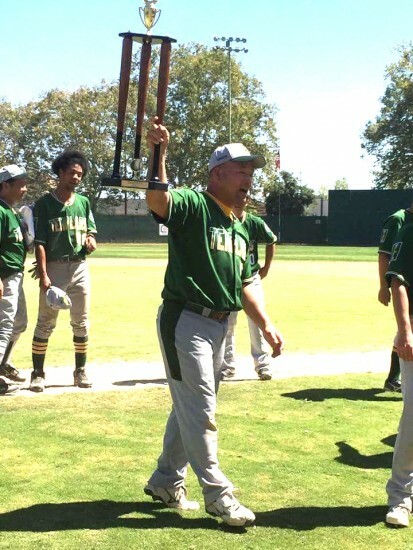 Addendum – Lil Tokio Giants won the consolation game over the Gardena Knights, 12-7. The Templars lined up to congratulate the Florin team.